These devices are being labeled “smartpens” and are the very latest in note taking tools. The Livescribe 3 gadgets are being nicknamed smartpens are devices that are used to automatically transfer notes that have been written by hand onto the screen of a tablet or smartphone. However, they also have a type of capacitive tip that allow them to be used as a stylus, as well. The Livescribe 3s are in essence gadgets that work like a premium form of ballpoint pen that will allow you to take notes on paper and wirelessly transfer them to the virtual world in a quick and easy way. It connects to the mobile device by way of Bluetooth. Once that connection has been activated and the supporting app has been launched on a smartphone or tablet, any notes that are taken on paper through the use of the smartpen. These gadgets provide a comfortable and realistic bridge between handwriting and the digital world. At the same time, even if the gadgets aren’t activated, or connected to a mobile device, it can still perform. Its battery lasts as long as 14 hours and, as long as it is fully charged, it can store everything that has been written so that it can be transferred to the device once it is reconnected. Moreover, the pen can be used for activating the microphone of a device so that audio can be recorded at the appropriate location within the notes. Beyond that, it also has a cap that converts the traditional pen into a stylus that can be used against the screen of the smartphone or tablet. These gadgets are compatible with iPhone 4S devices and newer, as well as everything including and after the third generation of full sized iPads, all of the iPad Mini tablets, and everything including and after the iPod Touch fifth generation. 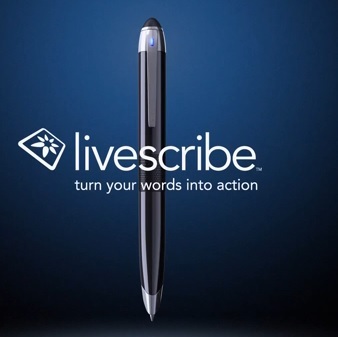 There are two different version of the Livescribe gadgets. The first smartpen costs $149.95 (RM471), and includes both a USB charging cable and a 50 page notebook. The other model is the Pro Edition, which costs $199.99 and includes the charging cable, a 100 page notebook, an additional ink cartridge, and a subscription for one year to Evernote Premium. Already available in the United States, its launch in Canada, Europe, and Asia is coming soon.